It seems like there is probably room for a tool that figures out a path from point A to point B. This might also make the code more maintainable — instead of me going and making new methods in the chain from A to B through six intermediate methods, maybe the tool can find a path that goes through only two classes. I can imagine the tool giving me the shortest path through public methods, and (if it exists) the shortest path that requires private variables or methods. Maybe it would find that there is a private variable that, if I made a public getter, I could use. There is also a tool called Strathcona which does something sort of similar — it finds examples of existing code that goes from A to B. I don’t think that would have helped me with the specific things I was looking for, because I don’t think there was any existing code anywhere that did all of what I wanted to do. It might have helped me get from A to C and then from C to A, however. What would a language developed by someone with a non-Indo-European background look like? What would a language developed by someone whose mother “tongue” was sign language? I was reminded of something I saw ten years ago: a woman commented that if a woman had invented the WIMP interface, there would have been two cursors. It took me way longer than it should have to get setup for my current project. I need to change some very fundamental behaviours of Eclipse. There is a plugin that does 80% of what I want, so I need to modify it. I got tons of errors because the projects weren’t set up right to refer to each other, and setting them up by hand would have been a nightmare. then select the packages that I wanted the source for, Add, and then Finish. with the first “i” selected If you type in “fooIndex”, then all the “i”s in the line change to “fooIndex”. Pressing tab takes you to the “array”, where you can then type in the name of the array. Press return, and then you are sent to the middle of the curly braces. I found two really cool Eclipse keyboard shortcuts today. Quick Access (Control-3): This brings up a dialog box. Start typing, and it will present a selection list of windows whose title contains the text you just typed. Thus, if you type “expl”, it will present “Package Explorer”, “CVS Package Explorer”, “Project Explorer”, and so on. You can also type the names of the files that you have open, e.g. “foo” to get “Foo.java” as a selection option. (It does not take you to method names or classes, just window names.) Way cool. I think I’m never touching the mouse again. Ever. Word Completion (Alt-/), aka “hippy completion”: When you are editingcode, you can type a few letters, then Alt-/, and Eclipse will fill in the rest of the word with a guess as to what you meant. For example, if I type “Fo”+Alt-/, it might present “FooFactory” first, then “FooTemplate”, then “ForeignFilmDatabase”, etc. When it reaches imagination failure, goes back to the first one. It is case-aware, so it would not present “for” or “format” or “foo”. It seems to be pretty clever about its guesses, too. I had had a problem with horizontal lines in my census maps mashups for a long time. Note the line at the bottom left. 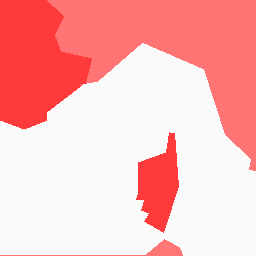 It turned out to be a bug in the gd polygon fill code. The fix turned out to be a very small number of lines of code, so if you are having problems with horizontal lines occasionally appearing in your images, look there. HistogramTable.java — a Decorator that takes a Prefuse Table object and creates another Table (as a subclass) that has two columns for every column of the source: one column to define the range of a bin and one that says how many objects are in that range. HistogramGraph.java — a JComponent subclass which displays a graph for a bin/count pair of a HistogramTable. HistogramFrame.java — a JFrame subclass which lets you switch between all the data columns in a histogram and also lets you reset the bin count on the fly. HistogramTableTest.java — JUnit4 tests for HistogramTable. There is a bug somewhere that manifests itself in HistogramGraph. If you select “Species Name” and then “Petal Width”, the first two x-axis labels are species names instead of numbers. I’ve looked at this enough to decide that it is quite possibly a Prefuse bug, and that it was not worth my time to try to fix it. I only recognize two types of column, numeric and string. I don’t distinguish between ints, floats, and doubles. Everything else is a string. I haven’t tested with boolean columns. I suspect that it will treat them as strings, and so it might just happen to do the right thing. I haven’t tested with derived columns. It might accidentally work, but I don’t know. I encourage people to give me feedback on these. While I’ve done a lot of coding, I am relatively new to Java, so am quite willing to believe that I did something in a suboptimal way. Administrative note: I’ve made a new category “robobait” for postings whose purpose is primarily to alert search engines to the existence of some other page. These are likely to be less interesting to human beings. I’m also going to put “robobait” at the beginning of posting titles for robobait postings.